Discussion in 'Boxing Discussion' started by D 1 Wrestler, Aug 8, 2015. LMAO!!!!!! Floyd is in so many people's heads, INCLUDING SHERDOG! NO matter how much they try to deny it! This isn't thread-worthy, it's ban-worthy. Are each of those 10k? So it's like a mil cash? I'd like to see Bill Gates prepare for a trip. He probably walks around with bricks of solid gold in his brief case. He's baiting haters to ensure more PPV buys. The guy lives a billionaire lifestyle on millionare money. Is his 'brand' big enough to sustain the way he lives once the fights stop? Why does Floyd have a woman's purse? ps: btw you look just like your son in the pic, Mrs. Mayweather. I don't understand why he doesn't use a bank. How much you want to bet the leeches he surrounds himself with takes bills whenever they can. What may amount to several thousand dollars, Floyd probably wouldn't even notice it missing. It's sad that money can't buy a brain. 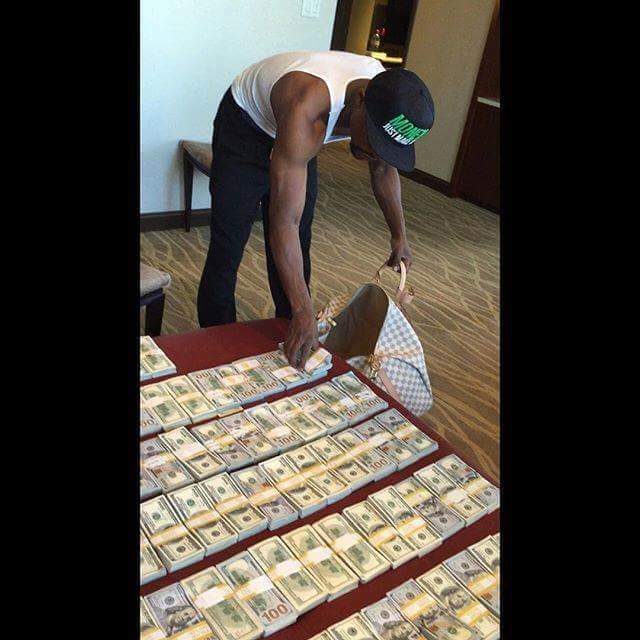 He prolly withdrew the money for this pic, and he's packing it up to take it back to the bank.